To get to Sandy Oliver’s homestead and garden, you have to first take a ferry ride because she lives on the small and picturesque island of Isleboro, just off the coast of Maine. 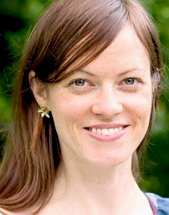 Sandy is an acclaimed food historian who has written many books about foodways and traditions of the eastern states. And indeed, her kitchen gives off the warm, cozy aura of stepping back in time. I first came across Sandy’s recipes in one of her more recent books: Maine Home Cooking. I loved how the recipes felt tried and true, and rich with the history of having fed countless families over many generations. I was therefore elated when Sandy was kind enough to offer to share her famous dilly green beans recipe for this video recipe. (Well, she says she’s not famous for it, but it does sound like everyone in the area who knows Sandy, also knows her dilly beans and awaits them with much anticipation at potlucks and on her holiday table). I first had dilly beans in my home Canadian province of Nova Scotia, made by my boyfriend at the time’s mom and gifted preciously to both of us. But the poor guy barely got to eat any of his mom’s beloved pickles because within 24 hours, I had pretty much single-handedly devoured the whole jar. Once finished, I even drank some of the brine right out of the jar. I couldn’t believe how good they were. Green beans had never been particularly appealing to me, I’ll eat them if someone puts them on my plate. But to me they are one of the plainer vegetables. Nothing to write home about. I get much more excited about dry beans, and all their myriad varieties and colors. But pickled, green beans do suddenly take on a whole new persona. Lo and behold, they turn zesty, crispy, with an irresistible twang of salty, dilly, garlicky vinegar. I grew up fairly exclusively with dilly cucumber pickles, the occasional pickled beets that my mom was fond of, and my grandpa’s cherished green tomato chow chow (which I plan to share with you here one of these days). So I was grateful to have my repertoire of pickles expanded. Move over pickled cucumbers! There was now a brand new dilly pickled veg in town. Since then, I’ve often made dilly beans but I usually make the lacto-fermented version because I tend to be a little lazy about canning. (Plus I’m a huge fan of lacto-fermented pickles for both their taste, ease of preparation, and health benefits). 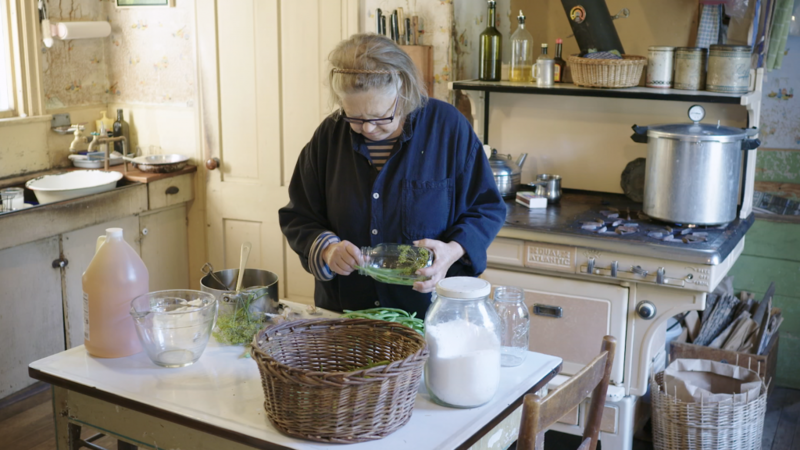 But Sandy’s recipe has reminded me that there is nothing quite like a dilly vinegar pickle and she has inspired me to make these dilly beans once again. I hope you also might feel inspired to make these again, or to try them for the first time! Please share in the comments… have you made or eaten dilly beans before? Dilly beans are zesty and crispy, with an irresistible twang of salty, garlicky vinegar. Read more about Aube Giroux's time with Sandy Kitchen Vignettes. If you have never canned before, be sure to follow guidelines such as The Complete USDA Guide to Home Canning to ensure you are canning safely. Sterilize your jars before packing the green beans. Evenly distribute at the bottom of each jar: one clove of garlic, dried dill seeds or green dill head, a sprinkle of crushed red pepper if using. Wash the beans well and remove the stem ends of the beans, packing them in the jars as tightly as you can. Heat all the brine ingredients just until the brine comes to a boil, making sure the salt is completely dissolved. Pour the hot brine over the beans in each jar making sure that you leave a half-inch headroom. Ensure the lip of the jar is dry by running a clean cloth over the top. Put the lid and rings on and close it finger-tight. Process the jars in a boiling water bath for twelve minutes, remove and allow to cool and seal. You will hear the jars pop if they have sealed properly. Tighten rings again if needed. Dilly beans are a lovely accompaniment to just about any meal, and they look great on the holiday table. Sandy recommends you can also break up the beans in shorter lengths to make pickles to add to a salad. Enjoy your dillies! If using long green beans that fill a quart jar (as Sandy does in the video), you will need to double the brine below in order to have enough.